UPDATE: For details on the station’s grand opening, click here. The White Marsh Volunteer Fire Company’s new station opened for business on Friday. We’re now responding from our new station at 10331 Philadelphia Road, White Marsh, MD 21162. P.O. Box 309 should still be used for postal mail. Our phone numbers are 410-933-0100 or 410-887-5770 . Please do not try to use our old number as it was not transferable and will no longer work. Please remember to call 911 in case of emergency. The new station broke ground in November 2016. WMVFC has grown to over 200 members and had outgrown its 68-year-old facility on Ebenezer Road. The previous station was built in 1949. Located between the CSX railroad tracks and Philadelphia Road, approximately 11,000 cars passed by WMVFC on a daily basis. 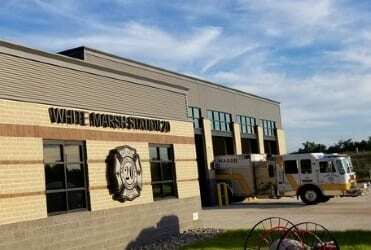 The new, approximately 20,000-square-foot facility will utilizes an optimal floor plan for modern-day emergency response and is intended to meet the needs of WMVFC’s growing membership. It features individual bunks, an indoor training facility, showers for each volunteer, a gym, kitchen, and even a study. A grand opening event is planned for October 6th.